Whether you are a pro or amateur, the local area has been host to some of the best world class fishing competitions in the nation. Dakota Custom Hunts can offer a variety of fishing spots and can assist in scheduling your next fishing excursion with a guide or unguided. The most common species of fish in the river are Walleye, (small and large mouth) Bass, Catfish, Northern Pike and Paddlefish (limited to below the Dam) Not to mention the excellent hunting for duck and geese. 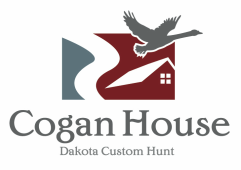 The Cogan House location over the river offers a variety of opportunities for all hunters, families and individuals. If you enjoy relaxing in a boat, canoe or kayak or speeding along the river on a jet ski the options could be endless. So make sure to bring your water craft of whichever sort to enjoy the unmatched natural beauty of the Missouri River. Transportation for your canoes or kayaks can be arranged.